The wait is almost over: The Samsung Galaxy S III will be available from five U.S. carriers beginning later this month. AT&T, Sprint, T-Mobile, Verizon, and U.S. Cellular will all get versions of the Galaxy S III. Unlike the global version of the Galaxy S III, the U.S. versions will not have the quad-core Exynos processor. Pricing and availability will be announced by the individual carriers in the coming weeks, but Samsung says that prices will start at $200. The Galaxy S III will be powered by a 1.5GHz Qualcomm Snapdragon S4 dual-core processor. There were early reports that Samsung’s Exynos processor might not be compatible with U.S. LTE networks, but Samsung has yet to state why the U.S. version comes with a different processor. HTC pulled a similar trick with the One X: The global version of that phone runs on an Nvidia Tegra 3 processor, while the U.S. version uses a dual-core Qualcomm Snapdragon S4 processor -- the same as the one found in the U.S. Galaxy S III. In this case, Nvidia’s quad-core processor was not yet compatible with AT&T’s LTE network at the time of the One X’s release. In our benchmarks, however, the U.S. version of the One X did quite well. 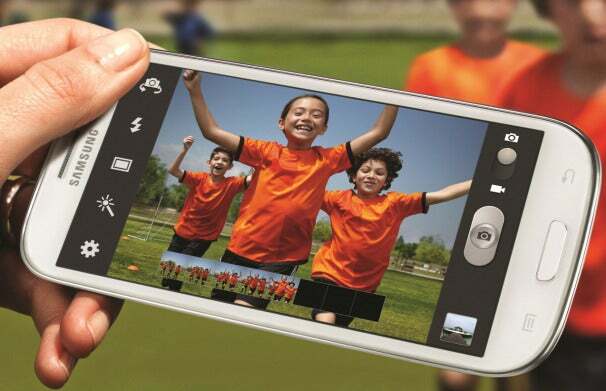 The Galaxy S III is 8.6mm thin and sports a 4.8-inch display with a very small bezel. Running Android 4.0, it has new features like a content-sharing service, a voice-activated virtual assistant, and motion controls. It can also tracks your eyes via the front-facing camera to keep the phone on while you’re using it. When you put the phone down, the screen will turn off. We got our hands on the global version of the phone last month -- check out our first impressions to get a feel of Samsung's newest offering. Stay tuned for PCWorld’s full rated review of the U.S. Galaxy S III in the next few weeks.